At the beginning of the summer I wrote a list of all the fun things we wanted to do as a family, from eating ice creams at the beach to camping underneath the stars. We slowly but surely ticked off most of them and suddenly Autumn is just around the corner and I want to continue the fun. 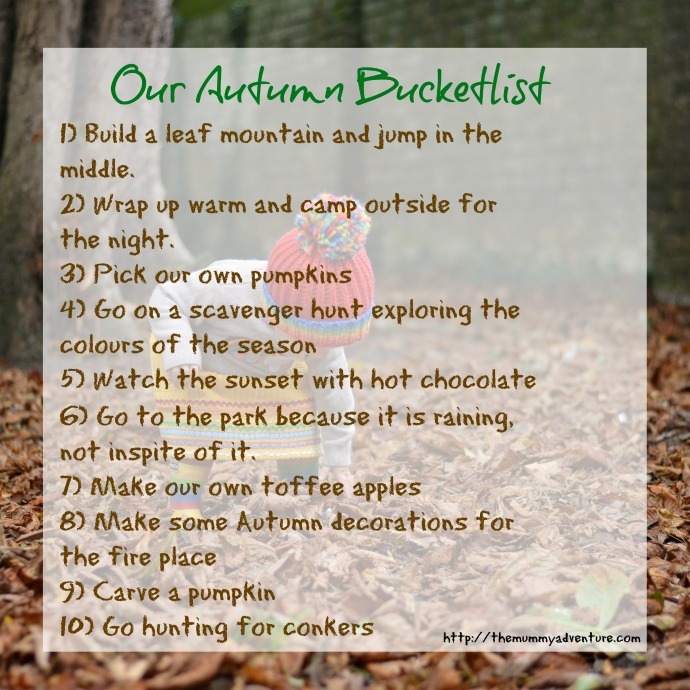 I have written our Autumn family bucketlist with some of the fun activities we want to do as the seasons change. I love Autumn for the colours, the rich golds and browns of the leaves falling off the trees and I want to spend as much time as we can watching the world change around us. I started the list with my favourite one, raking up all the leaves and jumping right in the middle. We have our own garden now so we have no excuse not to play in the falling leaves and the park next door is full of trees that are already shedding their summer greenery. The boys love everything Halloween related so as well as dressing up for the big day, I want to pick and carve our own pumpkins, make toffee apples with the ones already growing on our trees an go trick or treating around our neighbours. I am still feeling a little reluctant to let go of the summer, my sandals won't be getting packed away anytime soon anyway, but I am getting excited for Autumn and all the fun it will hopefully bring.